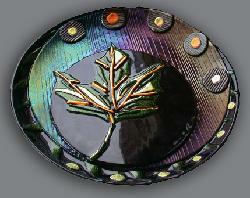 Carrie is a glass artist that comes to Maine via Arizona. A native of Southern Arizona, Carrie has made Maine her home since July 2004. She absolutely loves living in Maine and says it will take a bulldozer to mover her out. She has been showcasing her work for more than 10 years both in Maine and Arizona. Carrie has received 2 degrees, one from Northern Arizona University in Business Administration and one from the University of Arizona in Fine Arts with a major in Graphic Design, Illustration and Painting. 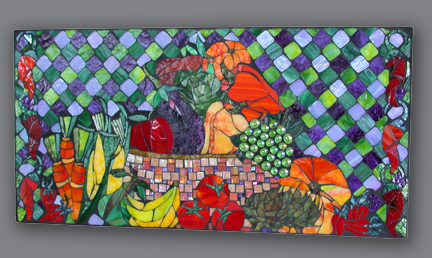 Carrie started experimenting in Mosaics around 2001. 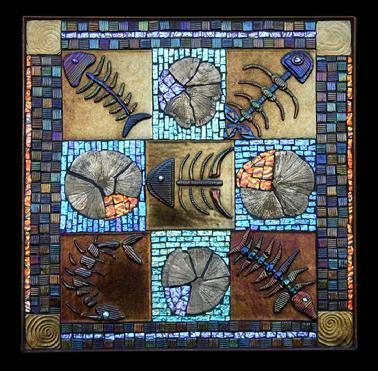 She has never looked back and has expanded her work to incorporating fused glass in her mosaics and as individual pieces . Her inspiration comes from nature. She uses the beauty that is found in nature. She loves to play with colors, shapes and textures to create her pieces. Most of Carrie’s pieces have their beginning from a flea m arket or the bottom of a trash barrel. She loves working with old and used items and breathing new life into them. Another one of her passions is to experiment with old objects or items found in nature such as rocks, pebbles, wood, beach glass and rusted metal. Each piece Carrie makes is a one of a kind piece. Some pieces may look similar but no two are alike. 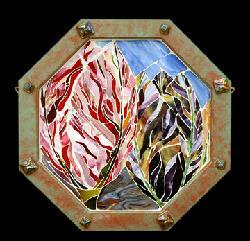 Each piece is made completely by Carrie and she will be happy to do installations in the home, garden or public space. You can find more of Carrie’s work at www.naturesmosaics.com.